Welcome back to Who’s That Pokémon? the feature series regarding the Pokémon we can expect to see in the upcoming games. From Rowlet to Tapu Koko, and Drampa to Silvally, we have covered them all, but now we have another batch of eight Pokémon to cover, so get ready for another instalment of Who’s That Pokémon? We dedicate this edition to Brionne’s evolved form, Primarina! Description: “As it dances, Primarina releases balloons of water into the area around itself, moving them using the sound waves from its voice. The sight of moonlight reflecting off its glittering balloons creates a magical scene. Since Primarina controls its balloons using its voice, any injury to its throat can become a grave problem. Its greatest enemies are arid environments and the overuse of its voice during back-to-back battles. 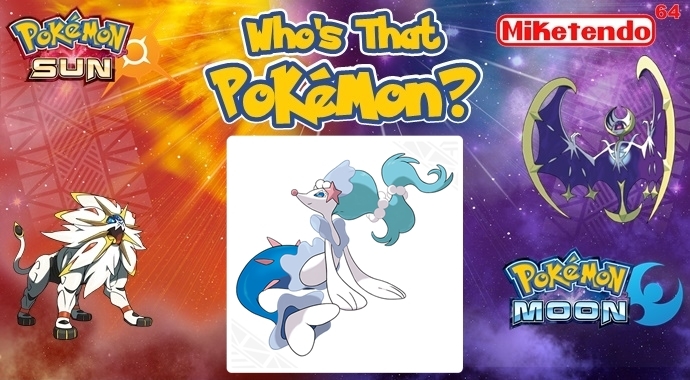 Tags: Pokemon Moon, Pokemon Sun, Primarina, Who's That Pokémon? Categorised in: Pokémon Sun & Moon, Pokemon, Who's That Pokémon?